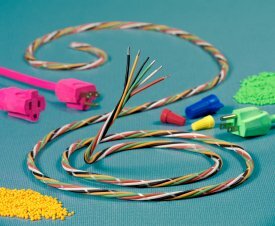 A new series of Elexar thermoplastic elastomer (TPE) compounds for wire and cable and molded products provides a combination of RoHS compliance, UL-V0 flame retardance, and excellent performance over a wide range of end use conditions, it was announced today by the Thermoplastic Elastomer Division of Teknor Apex Company. The Elexar High-Performance FR series includes six grades, with Shore A hardness ranging from 58 to 85, upper use temperature from 105 to 125 ºC., low-temperature flexibility down to -50 °C., excellent UV resistance, and good oil resistance. For applications where appearance is critical, the compounds provide excellent colorability and non-blooming surfaces, according to Keith Saunders, market manager. "Elexar HPFR compounds embody a hard-to-find combination of outstanding end-use performance and compliance with the stringent standards required in the global marketplace," said Dr. Saunders. "Conventional flame retardant TPEs not only fail to comply with the RoHS directives but are more limited in terms of flame test ratings and service temperatures. In addition, their flame retardant formulations often present the problem of blooming or surface staining."
? Insulation and jacketing for automation and control cables, fiber optic cables, specialty low-voltage power cables, appliance wire, and flexible cord. The new Elexar compounds meet standards specified under UL 1061. Unlike conventional TPEs, they pass the UL VW-1 vertical flame test for cable jacketing.
? Molded electrical components such as splice enclosures, connectors, grommets, strain reliefs, plugs, and over-molded transformers.
? Consumer and industrial goods such as profiles, furniture components, and moldings for recreational vehicles.